1900s Celluloid Cover Advertising Ink Blotter Hat Millinery Whitehead Hoag Co.
Here’s a neat piece of advertising. A celluloid (cover only) ink blotter. This great piece of advertising is printed by the Whitehead & Hoag Company in 1907. 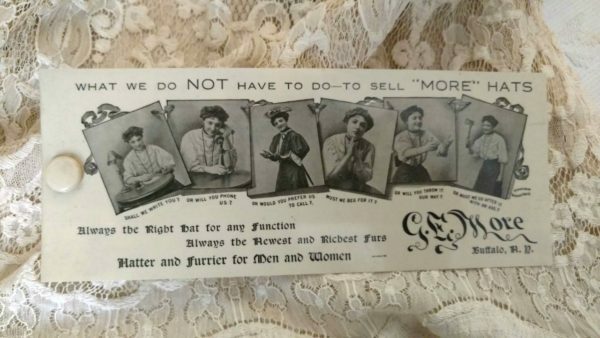 Advertising for the G. E More, Buffalo, N.Y. “Hatter and Furrier for Men and Women”. “Always the right hat for any function” “Always the newest and richest furs”. The cover features a photo of six women, each offering the customer their help. Interesting sentiments. This is a cover only with no ink blotters attached. A great piece of vintage advertising.